This essential guide for amputees helps to walk patients through the healthcare process, how they need to be more involved in their healthcare to advocate for themselves and their prosthetist, and what to expect as it relates to coverage, reimbursement, and denials. Get this guide today to help educate your patients so they can help you! 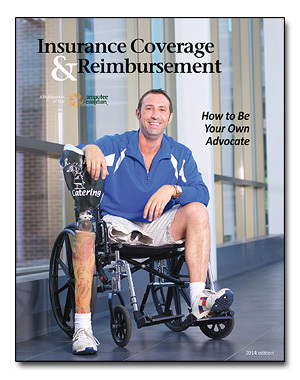 This magazine is broken into four sections of information for amputees including: Be Your Own Advocate, Private Insurance, Government Programs, and Helpful Information for Appeals/State Studies. My State Has Fair Insurance for Amputees - Now What? 2014, 8 1/2" x 11", Paperback, 98 pages. No ads. The product price shown currently includes all shipping and handling charges for standard ground shipping withing the United States unless otherwise noted. If you wish to ship an order outside of the United States, please contact the Amputee Coalition to request a quote for shipping & handling charges in your location. Please allow 2-3 weeks for order delivery.